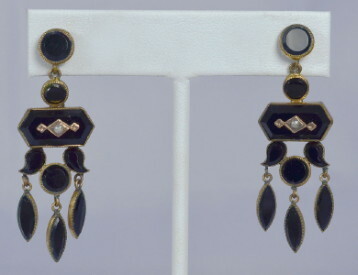 1900's vintage Edwardian era earrings. Onyx and 12K gold plated base metal. Drops consist of small button with oblong hexagon and three extensions. Geometric gold embellishment on hexagon with tiny pearl center. Extensions are three marquis shape drops hanging from paislies and round. Button top with posts added by professional jeweler. Marked 12KGF on butterfly. All original Edwardian era, true 1900's vintage... (except for posts). Included with the purchase is a copy of the original Titanic rental inventory page listing the item & photo copy authentication between the production and Repeat Performance, documenting specifically item RP#100-165JLE, the identifiable inventory number of the earrings. Very good condition. Shows some slight wear to plating when examined under loop.